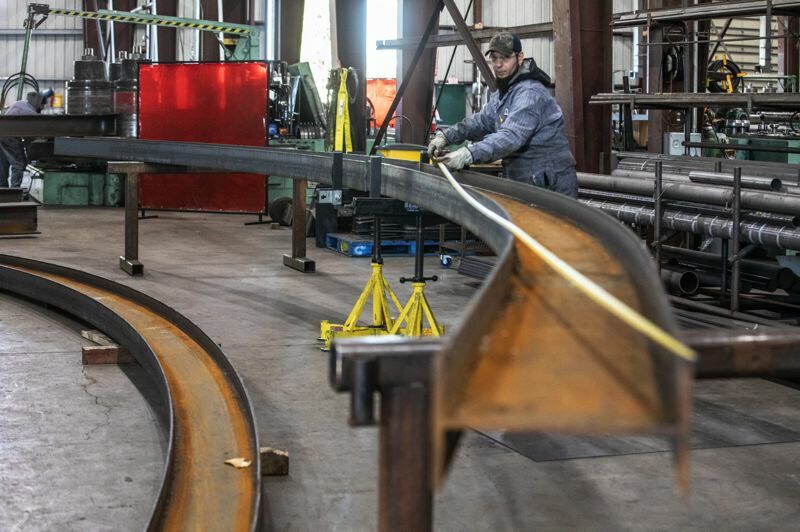 Tualatin-based Albina Co. has provided bent steel for some of the country's biggest construction projects. Brian and Jaime Smith are used to receiving quizzical looks when they talk about what their family-owned company does. 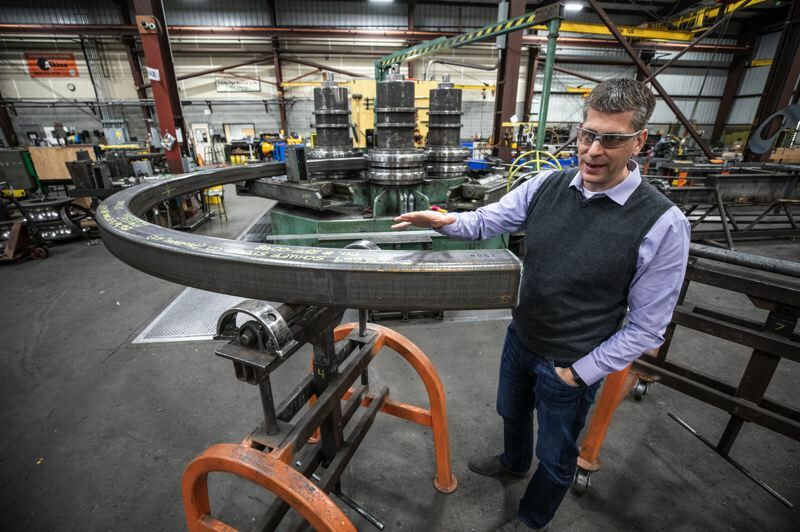 In the 80 years since it was founded, Albina Co. Inc. has grown from a small Portland presence to its current status as part of an elite group of about 15 companies known for providing bent steel and other materials for some of the biggest projects around the country. The work of Albina's shop crew, for example, can be seen in the award-winning steel-and-glass canopy at Portland International Airport, in the tubing that that graces the outside of the Edith Green-Wendell Wyatt Federal Courthouse and in the oversized spheres that sit outside Amazon's offices in Seattle. 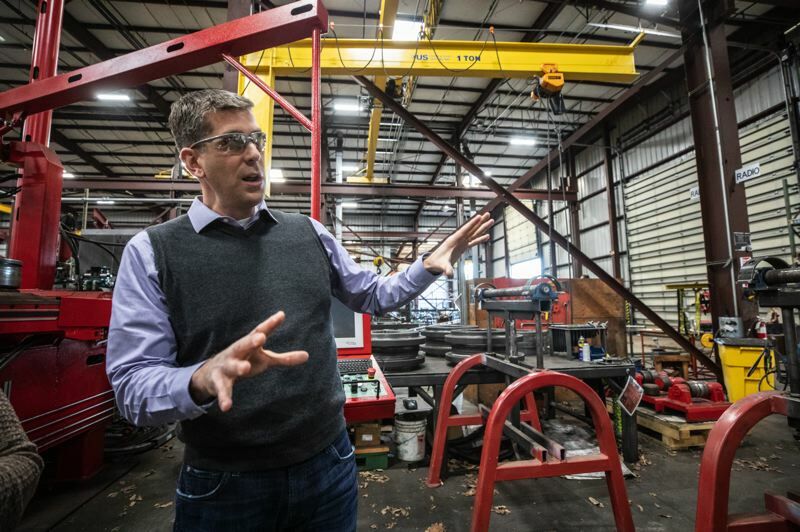 But even with those highly visible projects to the company's credit, Brian Smith, who serves as president, and his wife Jaime, Albina's marketing director, spend a lot of their time educating people about the role their company plays in the built environment. 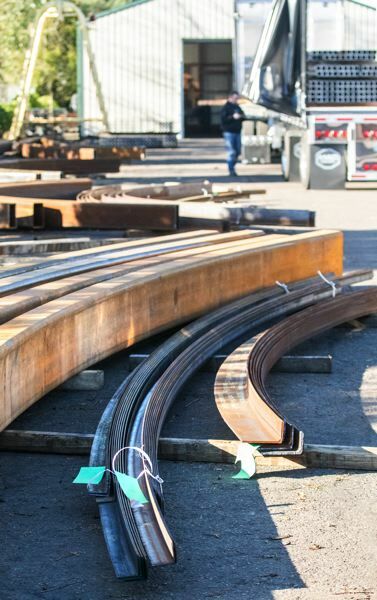 "If we say we're a steel-bending company, people say, 'What's that?'" Brian Smith said "People outside the industry, when you talk to them, they don't even realize that this type of business exists. They kind of just think [the steel] comes that way." The company got its start in 1939 in a dirt-floored horse stable, drawing its name from the district where it was located. "It was underneath the Fremont Bridge, over on Russell Street," Brian Smith said. "The name, at the time, was Albina Pipe Bending Company. Pretty simple." His grandfather, John, was the company's first foreman. He left for a time to fight in World War II. When he returned, the owners were selling the business. So, John and his wife, Verna, decided to buy the company. "It was mainly a pipe-bending blacksmith shop," Smith said. "They would heat up the steel and form it and bend it." Smith's grandfather eventually built a machine, powered with an engine and differential from a Model T car, to handle the labor of bending materials and the company began to build a local reputation in Portland. While Smith's grandfather handled the shop operations, his grandmother took care of bookkeeping and other office duties. According to family lore, she was also a driving force in the company's growth. "My mom and dad said grandma drove some of the growth and direction of the company," Smith said. In the mid-1960s, the company moved to a larger, 17,000-square-foot building near Southeast 78th Avenue and Halsey on an acre of land right next to Interstate 84. Around that time, Smith's father, Bill, joined the company in a full-time capacity. He had worked at Albina while in high school, but had left to attend Portland State University followed by a tour in Vietnam. While Bill had majored in speech therapy in college, he seemed to find his niche when he returned to Albina Co.
"When dad got involved, the business really took its next big leap up," Brian Smith said. "Looking at old financials, he pretty much tripled the revenue that they were kicking out, which filled that shop up pretty quick." Bill and his wife, Kathleen, eventually purchased the company. By that time, Brian was working there during high-school summer vacations. "I was pushing brooms, running saws, running some of the smaller bending equipment ... pulling weeds, cleaning toilets," he said. "You name it, the ugly stuff that just needed to get done." Those tasks also helped convince him that he wanted to make the family business a career. So, he headed to Colorado State University, where he majored in business and entrepreneurship with a side of accounting courses. Shortly after he rejoined the family business, he began to campaign to move the company to a larger location. He ramped up his efforts after Albina was awarded a contract to bend steel for a new canopy at Portland International Airport. In order to work on the long pieces of steel, a hole had to be cut in the back of the building while a second smaller hole was cut at the front of the building. The pieces of steel were moved into the machine through the front hole and then the bent portions were moved out the building through the back opening. "We had people walking under the steel and it was going over the top of the machine. And I'm looking at that thinking, 'We are out of space,'" Smith said. "I said to my dad, we have to find a new place. He essentially said, 'You put together a business plan, you find the land, you get the financing and I'll sign off on it.'" Brian and Jaime, who were engaged at the time and would marry one year later, jumped into the task. Like Brian, Jaime had majored in business along with marketing, but neither had ever put together a business plan. So, they headed to the Multnomah County Library. "The web was fairly new — this was in 1999 — so we were pulling out reference books. We had to do market research," Brian said. "We did it the old school way," Jaime added. In between drawing up a business plan and talking to banks to find financing, they drew up a list of key features for a new location. "We knew we wanted about five acres," Brian Smith said. "We knew we wanted to have fairly good access in and out. We knew wanted it flat, and we knew we needed to be able to afford it." There were three possible areas up for consideration. The Northwest Portland industrial district was eliminated right away. "Even back then, it was pretty overgrown and pretty expensive," Smith said. The Clackamas corridor posed some interesting possibilities, but Smith wasn't convinced it offered the most economical situation. The area was booming at the time, which was pushing prices for land and construction up. Then there was Tualatin. Non-commercial development had yet to take hold on a wide scale in the suburb city. Building in Tualatin also offered the opportunity to build a facility custom-designed to meet the company's unique needs. While the company didn't receive any tax breaks or other incentives from the city of Tualatin, the relocation came with other benefits. "Our incentive was the price of land," Smith said. "It was not as expensive as Northwest Portland or Clackamas. Plus, there were already savings [with taxes] by leaving the city of Portland." Since 2001, when the company moved into its building on a six-acre site on Southwest Myslony Street, the third-generation leadership of Brian and Jamie has resulted in a quadrupling of revenue. The company's presence has expanded from a local business to its current national standing. 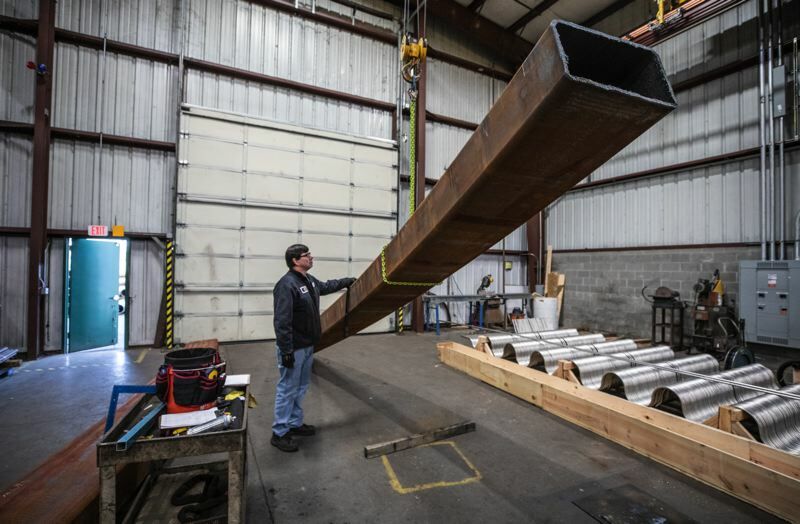 A walk through the Albina Co. shop on a recent morning revealed work under way — from spiral staircase parts to curved handrails to components for boilers — that will soon be headed to clients in Pennsylvania, Chicago and Arizona. That isn't to say the company doesn't have its challenges. Tariffs on steel have created uncertainty in the industry. Because its products end up in projects and equipment for clients across the country, Albina's office staff needs to be well versed in tax requirements and other regulations far beyond the borders of Oregon or even the Pacific Northwest. 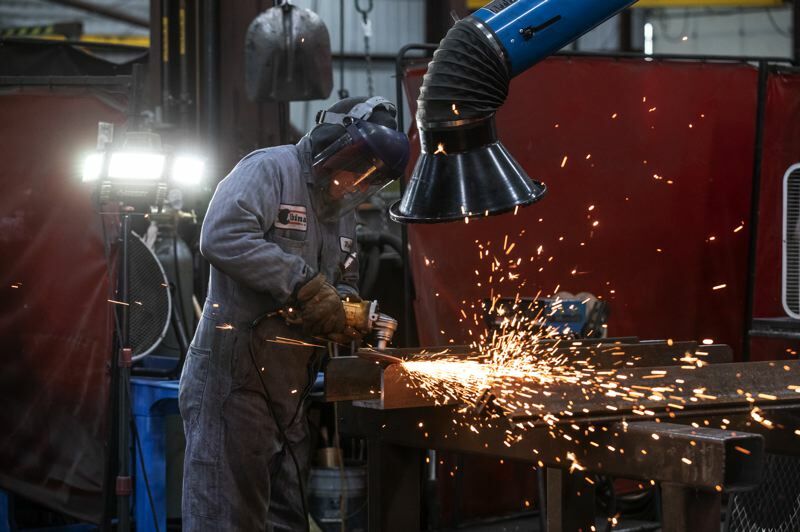 But unlike other companies in the manufacturing and building industries, Albina hasn't had to struggle with finding enough skilled workers. The company, which has a current roster of about 40 employees, regularly keeps people in the shop for seven to 10 years. Some of the employees in the office have been with the company for even longer. "We treat them like family," Brian Smith said. The company provides full health care benefits and a company-supported 401K plan — union shop workers also have a pension plan in place. Profits are turned into bonuses for employees. There's flex time for administrative workers. Even shop workers can tap into a flexible schedule that allows them to come in early — around 5 a.m. — and then leave by early afternoon. "That way, they can be there when their kids get home from school," Smith said. The company also has managed to find success in another area that other companies that bend steel are still struggling with. "A lot of these companies are pretty old school," Jaime said. "They haven't picked on things like social media. Even a web presence from some of these companies is difficult to do." Making the move from the yellow pages to Twitter and Instagram wasn't an overnight transition for Albina Co. The Smiths admit they don't have personal social media accounts, but Jaime realized the company needed to have that type of presence in order to woo a future generation of clients. So, she waded into the world of social media, from Instagram and Twitter to Facebook and LinkedIn. She added graphic and website design and search engine optimization to the mix. "I was all self-taught," she said. "I figured it all out on my own. The next step for the company is to make the move to digital. "We're trying to get away from paper," Jaime Smith said. "Our sales people still want something to hand to someone, so we're going to keep it around for a little while. But we have a big project going on right now where we're going to all pretty much all digital flyers or video."